It’s a cold, gray winter Saturday morning. The wind is whipping through the trees, and a mixture of sleet and snow is glazing your windows. And you have an adolescent dog racing around your house with a mitten in his mouth, full of energy and ready to party. You need some indoor ideas to tire this pup out! Food-stuffed toys! Don’t make the mistake of feeding a busy young dog in a dish. Dinnertime lasts 0.5 seconds, and then your dog is bored again. Mix his kibble with some water or canned food and stuff it into a Kong® or two and make mealtimes last a little longer. Freeze the Kong overnight for a tougher challenge. Pet supply stores carry all kinds of fun food puzzle toys these days. Hide and seek! Have a family member hide somewhere in the house with a favorite treat or toy, then send your dog to find them! (He can learn their names at the same time – “Find Susan!”) Or hide treats or toys around the house, gradually making the hides harder. School! I’ve never heard anyone complain that their dog was just too well trained. Rally obedience, agility, nosework, tricks classes – there are many fun class choices in person and online these days. Your dog can get as tired learning a new trick as he can on a walk. Chew chew! What’s the opposite of careening around the house trying to get you to play? Lying quietly with a chew toy. Some dogs will chew on anything at all, but most prefer something tasty. Fold a bully stick into an empty cereal box, or put some kibble in an open plastic water bottle. Fetch! If you have a dogproof area in your house, indoor fetch can wear off a few calories. Throw the ball up a set of stairs or down a hallway (preferably safely carpeted). If your dog doesn’t bring toys back, use a second, identical toy to tempt him back, then throw it when he drops the first one. Tug! Make sure you teach your dog the rules first, and tug of war can be a great workout for both of you. Treadmill! 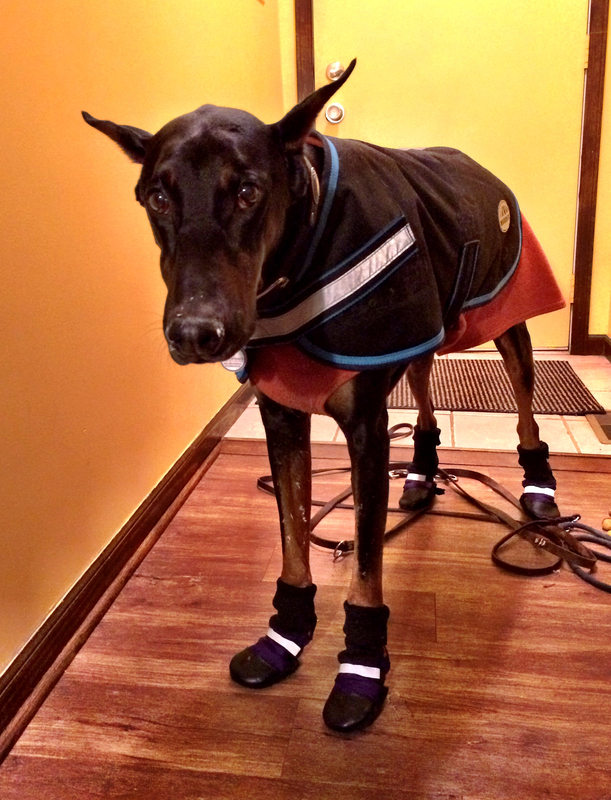 Teach your dog to walk, then trot on a treadmill, using tasty treats and starting slowly. Always supervise carefully, and never tie your dog, give him the choice to hop off when he gets tired. Play date! Invite one of your dog’s friends over, or go to their house for some chase and wrestling. 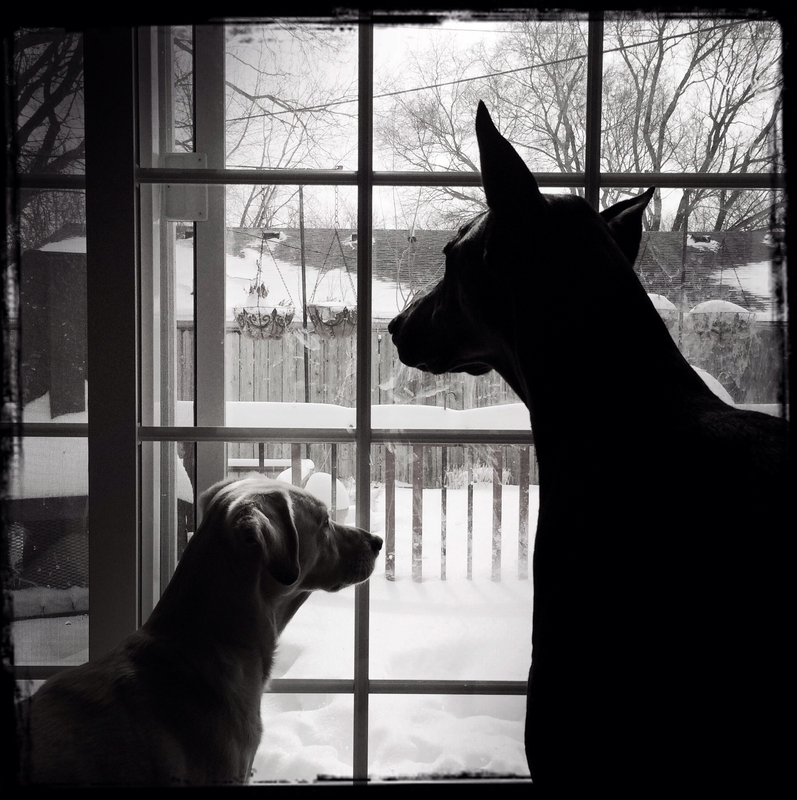 Perhaps the dogs will play in the snow in the yard while you watch from the window with some hot chocolate. Or, of course, you can get yourself and your dog bundled warmly and go for that walk anyway. 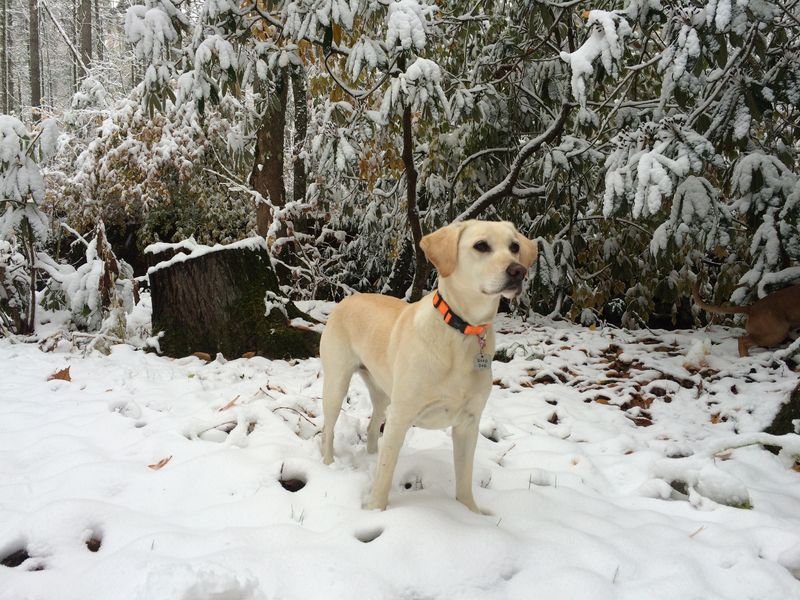 What do you do to keep your dogs amused when it’s too cold for outdoor activities? Please comment below!